You’ve seen it for sure. Your baby looks at your concerned face, and the bright smile washes away from hers. Or your toddler looks over at the crying child at the playground, frowns and hands him a toy. Can babies and toddlers be so intuitive about emotions at such a young age? Or are they imitating without actually feeling the same way? Early childhood researchers are getting to the root of such complex questions, thanks to creative experiments and brain imaging techniques. One of the areas under study is the development of empathy, which is defined as the ability to imagine how someone else is feeling in a particular situation and respond with care. Until quite recently, we thought babies and toddlers were too young for empathy, but it’s not true. For example, the skills needed to be empathetic include understanding how others feel and recognizing that you are a different person than your caregiver. Babies certainly do that in the first two years. As discussed in other BabySparks articles, babies learn to understand the world and the people around them in part by referencing their parents. As early as 6 months, babies show sensitivity to their parents’ emotions, which is one reason parents are encouraged to act upbeat when separating from their infants. Scientists know that certain areas of the brain ­including the frontal and parietal lobes­ are actively involved in how humans develop ‘social intelligence’. Now they are digging into the specific brain circuitry behind it, and their search has highlighted the role of ‘mirror neurons’. Mirror neurons fire both when we do an action ourselves, and when we watch others do a similar action. This means the infant is learning from her environment and she learns best through loving, responsive interactions with caregivers. For example, when your toddler points at a dog and looks concerned, she looks to you for your response. If you say, “Uh, oh. You look worried. Let me pick you up, so you feel safe around the puppy,” you are helping these pathways develop. And when you smile as you proceed to pet the puppy, your child learns to take her cues from your relaxed response and her stress levels will mirror yours. In this way you are role model for empathy. Why does empathy matter? How can I support it in my baby? Empathy is a foundational skill that will help your child understand the emotions and experiences of people around her. This is an important anchor of your child’s social development and her ability to build friendships and other important interpersonal relationships with children and adults as she grows. Caring adults who role model and prioritize empathy play a vital role and parents have opportunity to influence empathy at home, as I discuss in my latest book, Advantage, Mom: 20 Lessons from a Parenting Pro. We live in a society where middle and high school aged children often value achievement and individual happiness over caring for others, so it’s never too early to start encouraging empathy. Engage in games like peek-a-boo and itsy-bitsy spider. Remember to exaggerate your facial expressions, gestures, and tone of voice. This communicates increased excitement and promotes your child’s focus for learning the sequence and steps of the game. During these activities the baby is able to mirror what’s going on, which is one way to practice the feeling of being in-sync with their partner by matching the partner’s actions. Development of empathy changes a great deal in the first few years. 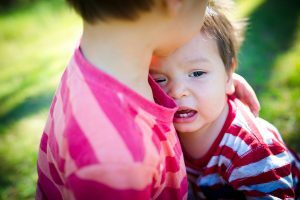 For instance, when one-year-olds witness another child crying from an injury, they seem to realize that distress is being felt by someone else, yet they’re often confused over what to do about it. They will, for instance, look at their own finger if they see another child’s finger is hurt, as if to double-check who is hurt. Beginning in the second year, they will offer active support, like hugs or giving a toy to the other child. Because toddlers are impulsive and still egocentric, this will not always happen; the same toddler who offers a toy today may hit his playmate with the toy tomorrow. But, like most abilities, your child will develop her skills over time. In most children, acts of empathy will eventually become more routine by age 3 or 4. So your patience is needed, along with your coaching, in order for your child’s abilities to blossom. Maureen O’Brien, PhD is a developmental psychologist, parenting coach and author of ‘Watch Me Grow: I’m One-Two-Three’, available at http://amzn.to/1QtvyFl. More parenting tips and resources can be found on www.destinationparenting.com.